TCCXQ optical assemblies integrate the high optical performances of TC Telecentric Lenses and the LTCLHP Series ability to provide accurate and reliable illumination. 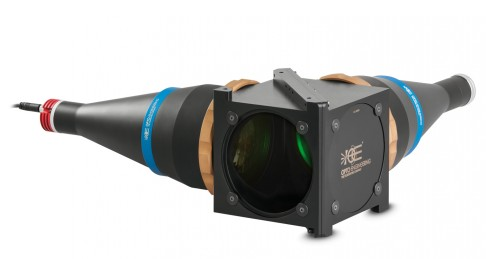 Pairing these two Opto Engineering flagship products results in a system completely free from straylights and back-reflections, while marking superior optical performances (in terms of resolution, telecentricity and distortion) even at the highest magnifications. This optical layout also minimizes the overall height of the system, while the placement of the camera port allows for easy phase and back-focal adjustments. TCCXQ assemblies can successfully employed in high accuracy measurement applications as well as Automated Optical Inspection (AOI) setups. See d in the drawing.